Warning: this mascara is only for those of you who want MAJOR lashes - I mean lashes that give a false eyelashes effect! Armani Beaute has many fantastic products. The line is filled with items and colors which reflect Giorgio Armani's meticulous attention to detail, knowledge of texture, color and of course superior performance. Eyes to Kill (great name!) is yet another example of this. 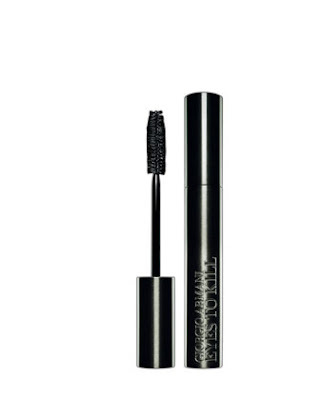 The mascara on the face of it looks standard - The brush is study, of average length and dimension and easy to use. However, on closer inspection, I noticed the brush has two flatter, wider sides which allowed me to really sweep the mascara across all my lashes. It gave me even more awesome length (my lashes are fairly long), volume, thickness and didn't clump, flake or dry hard/crunchy. This is a mascara that you can layer several times if you really want a dramatic effect (yes they will look like false lashes!). That being said, if you need major curl, this is not a curling formula, so I recommend experimenting with applying the mascara first, letting it dry fully and then curling with an eyelash curler. Sounds like I need to investigate. LOL. I'm always searching for the latest & greatest mascara. Thanks for sharing!